Among the collaborative cooking projects I did at the Great Western Casa McBardo (home base to Indirect Heat) is an adapted chai ice cream we served as one of the desserts to the roasting of a 50 pound pig. Yes, there was more than one dessert. 1. Slice and bash up 1x3 inch piece of fresh peeled ginger. 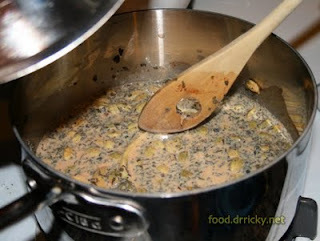 Add this to a nonreactive pot along with 1 bashed up sprig of fresh lemongrass and 2 cups of whole milk. 2. 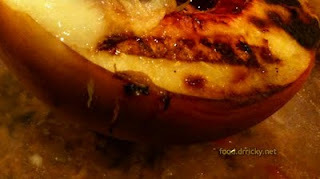 Crack up 4 tablespoons of whole cardamom, and add to the pot along with 2 tsp of freshly cracked black pepper, 2 tablespoons of cinnamon powder. 3. Add in 40 cloves, 3 tablespoons of dried basil, and 8 teaspoons of assam tea. 4. Bring to a boil, and simmer for 5 minutes. Turn off the heat, and allow to steep for 10 minutes, and strain into a measuring cup. Make up the volume with more milk up to 2 cups to allow for evaporation. 5. Return to the cleaned pot along with 2 cups of cream, and mix well. 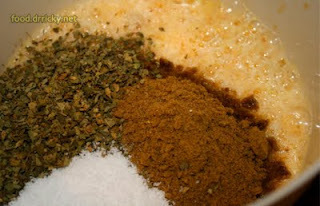 Add 1 split vanilla bean, scraping out the seeds, and 1/4 cup of sugar, and heat up to a simmer - do not allow to boil. Make sure that the sugar gets dissolved. Allow the vanilla to steep. 6. Meanwhile, beat 12 egg yolks until liquid, and gradually add 1/4 cup of sugar while beating (do not dump the sugar directly on egg yolks, as this will result in the proteins "salting out"). 7. 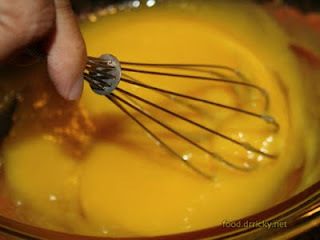 When the yolks are foamy and the sugar mostly dissolved, temper the yolks by adding the hot milk mixture into the yolks, and stir the custard back into the pot. 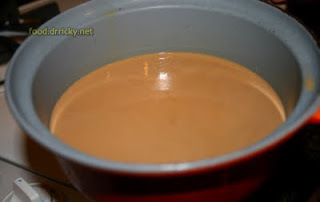 Cook the custard until the appropriate consistency, add 2 cups of room temperature cream to stop the cooking, and strain to remove any possible curdling. The vanilla bean should also be fished out, and can be reused for other things. Drying it out, and sticking it into a jar of sugar is traditional for making vanilla sugar. 8. Grind in a generous amount of fresh black pepper (fine grind). Don't skimp here, the cold will mute the bite of the spices. Chill overnight, and process in an ice cream machine.